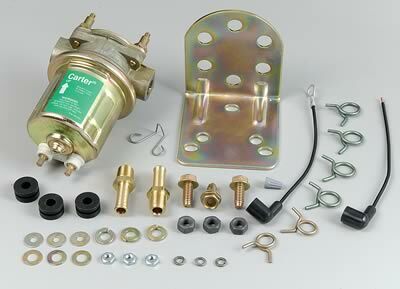 Brand:	Carter Product Line:	Carter Universal Rotary Vane Electric Fuel Pumps Free Flow Rate: 72 gph Maximum Pressure (psi): 6 psi Inlet Size: 1/4 in. NPT Inlet Quantity: Single Inlet Attachment: Female threads Outlet Size: 1/4 in. NPT Outlet Quantity: Single Outlet Attachment: Female threads Quantity: Sold individually. Fuel Pump, Electric, Competition Series, Rotary Vane, External, Universal, Each * Check to make sure this part fits your application Get the fuel flow you need. These universal rotary vane electric fuel pumps from Carter operate using leaded and unleaded gasoline, gasohol, and fuel boosters. They have an internal pressure-regulating valve, and feature free-flow fuel delivery. These pumps have no points to burn out, and no shaft seals to leak or deteriorate. Easy to install, these universal fuel pumps come with a complete installation package and instructions.